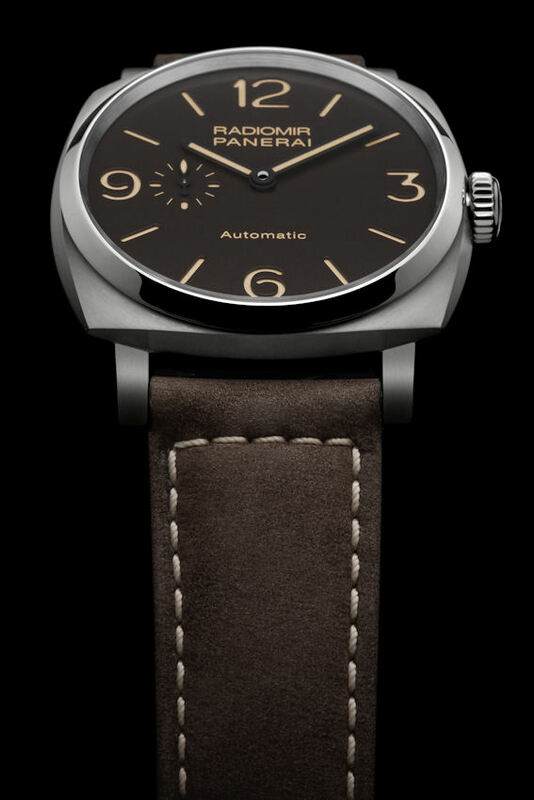 The 45mm case houses Panerai’s in-house P.5000 hand-wound movement with small seconds at 9 o’clock, made in the brand’s Neuchâtel manufacture. 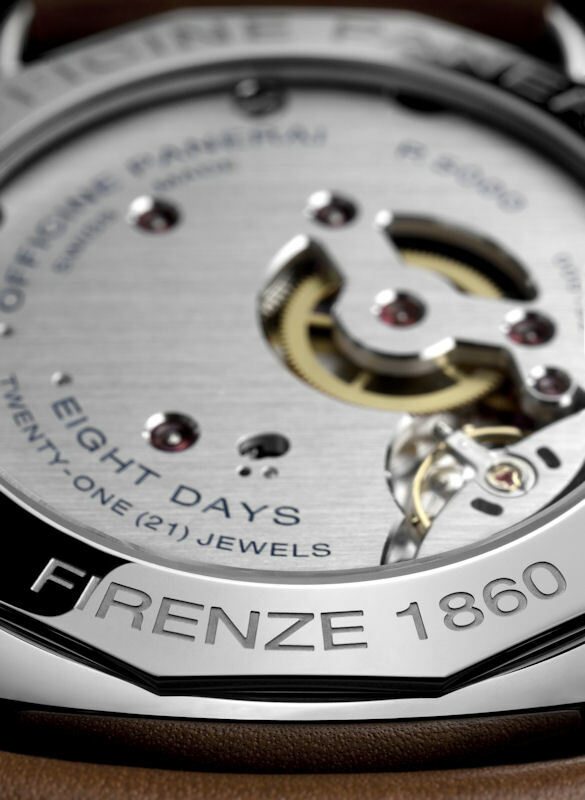 The movement features an eight-day power reserve, while the 316L stainless steel case offers 100-meter water resistance. 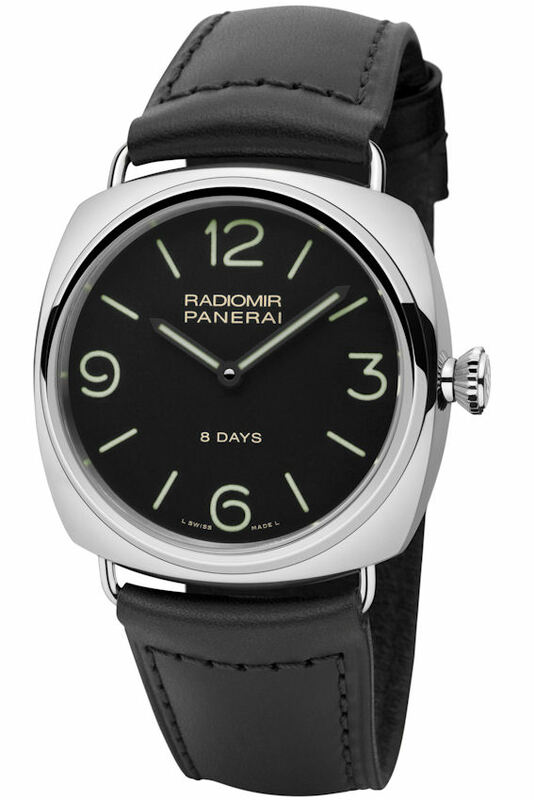 The new Radiomir 8 Days Acciaio is a simpler, dressier version of the PAM609 presented above. 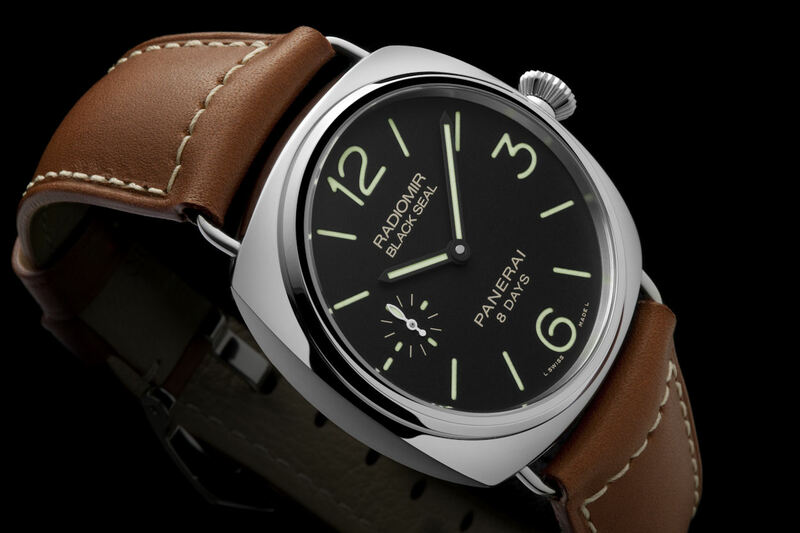 This model, also measuring 45mm, omits the small seconds for a cleaner look, and the black strap makes this the perfect Panerai for evening attire. This Radiomir 1940 features traditional lugs, formed from the same block of material as the case, and in this case, we’re talking about titanium – indeed two types of titanium. The caseband – the center section of the case that includes the lugs – is grade 2 titanium, an especially light alloy (40% lighter than steel) that is highly resistant to corrosion and amenable to being machined into complex forms. 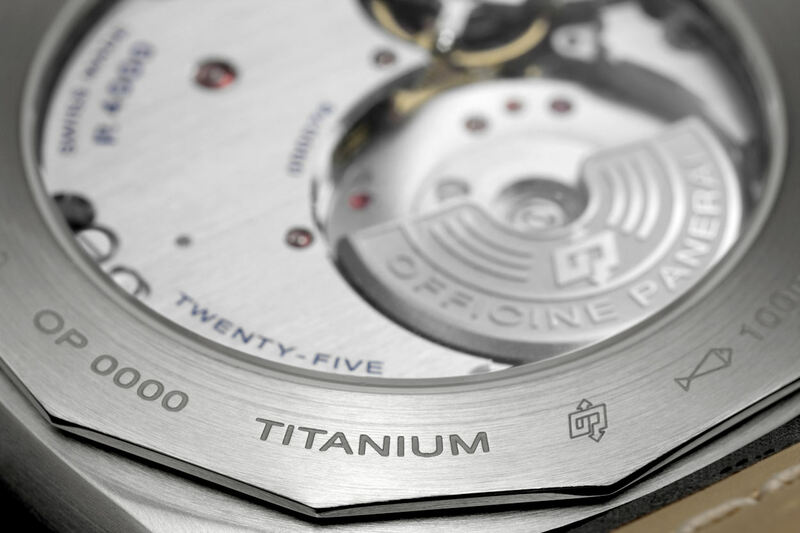 The bezel and crown, on the other hand, are grade 5 titanium, which unlike the former, can be polished to provide a pleasingly contrasting finish. The brown dial is the sandwich-construction variety, originally created by Panerai in the 1930s to ensure maximum legibility in low light. 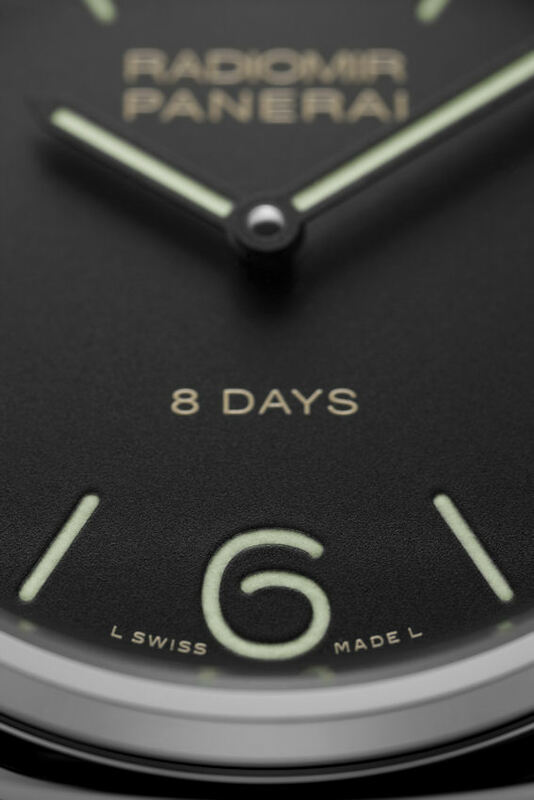 The ecru SuperLuminova gives the dial a tasty vintage patina. 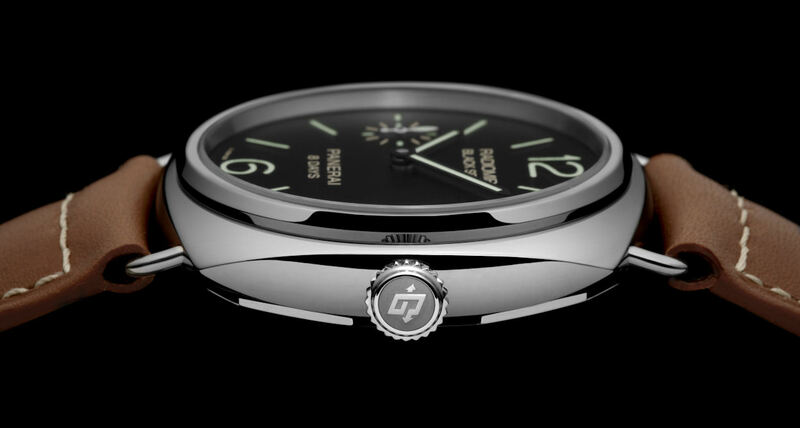 The display back offers a view of the Panerai P.4000 caliber. 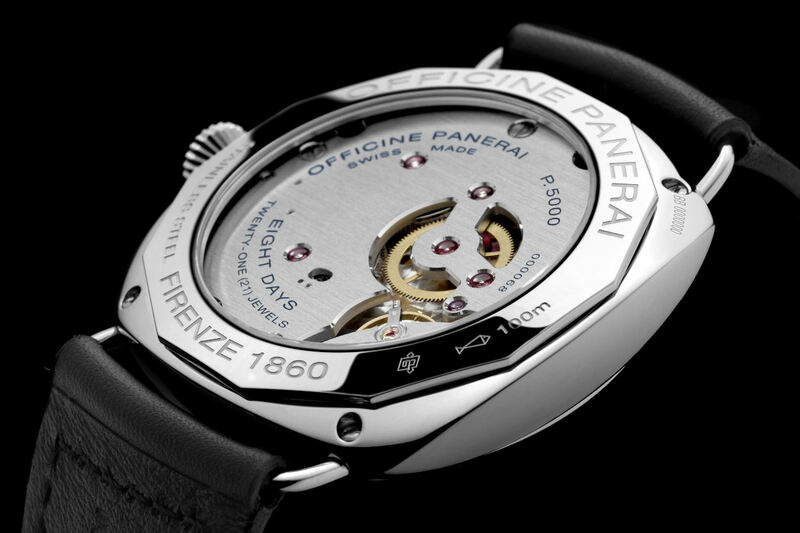 Designed and made entirely in Panerai’s Neuchâtel manufacture, this is the brand’s first automatic movement with a decentralized rotor. This construction allows a thinner movement. To maintain its winding efficiency, the rotor is fashioned from tungsten, a material with a particularly high specific weight, and it winds in both directions. The heavy rotor winds two barrels that allow the movement to run for three days on a single wind.